Earlier this week I received an email from a woman in Fredericksburg Texas. Somehow she had found out about my pie project and she wanted to know if she could pay me to bring a pie to a friend of hers who lives in my town. When I wrote her back, I explained that money was not the reason I was making pies, and then I asked her to tell me why she thought her friend deserved a pie. It took several days for her to get back to me because she was traveling and she could not get on the internet. When she finally saw my message, she wrote back immediately and gave many reasons why her friend deserved a pie. I was typing my reply to her email when my phone rang. As you might have guessed, it was the lady from Texas. She was thrilled that I would bring her friend a pie and could not thank me enough. My only request was that she call her friend to make sure that he would be home when I stopped by. 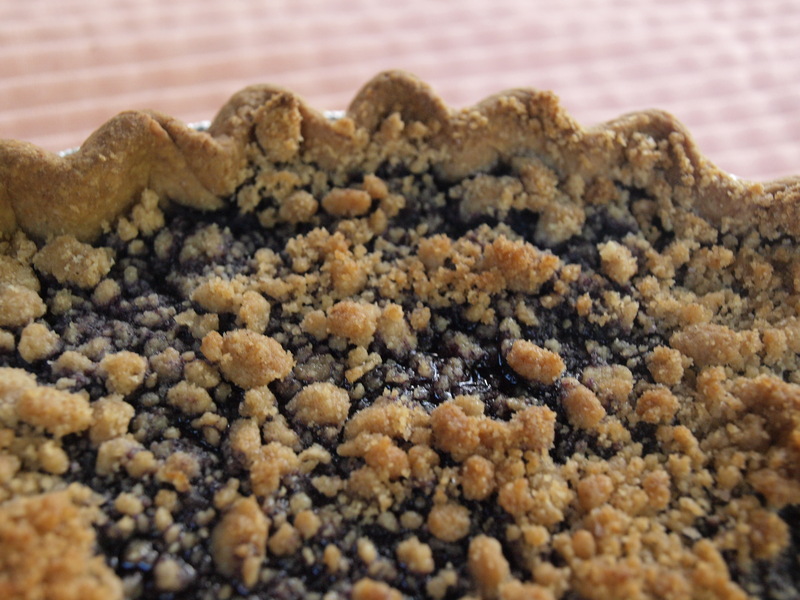 This afternoon I baked a Blueberry Crumb Crust Pie for a man that I had never met. When I delivered the pie I learned he was known as the “Lithia Magic Wand Maker.” He knew that the lady in Texas had something to do with him getting a pie and he was truly pleased to see me. This man had a pie story to tell me. Seems that this same lady sent him a pie via FedEx a number of years ago just as he was fixing to leave town. He took the box and put it in the car and drove on down the road. He planned to meet up with a friend, but that friend was too sick to see him, and so he kept on driving. Finally, four days later, he and a few friends were ready to eat the pie. He opened the FedEx box. Inside that was the box from the bakery. As he opened that box he saw his pie – with a rainbow of mold on it. As luck would have it, he was at a park where a festival of nature was being held. At this festival there was an art contest and anything from nature could be entered into the contest – and so this man decided to enter the moldy pie – and it won a prize! And then he thinks that his pie was probably eaten by some raccoons. But what a journey it had taken! The Lithia Magic Wand Maker told me that he planned on sharing his Blueberry Pie with a friend on Tuesday. That would make three people who were affected by one pie: the lady in Texas, this man and his friend. Imagine the implications if we could all do one small thing to brighten someone’s day. As we parted, this man told me how he and one of his dearest friends would say goodbye (in letters, emails, etc). And those are the words I will leave you all with tonight: Pi for now. 🙂 I love how all of the circumstances of how it all comes together.